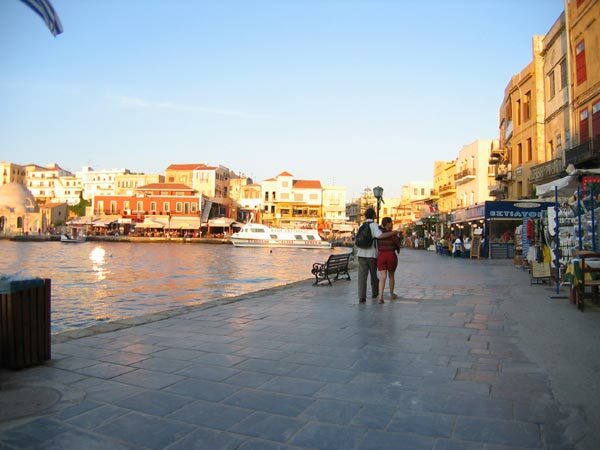 From the numbers of inhabitants to Heraklion only being on place two Chania is however the perhaps most beautiful city on Crete. Before one can discover and enjoy this beauty however, it applies first of all to maintain ground in the heart of the city center. Particularly with the motorcycle (without protecting sheet metal around itself) it is to be tormented again and again exciting, by the close road courses, until one finally reaches the Platia Sofoukli Venizelou, the central traffic junction of the city. Where the German normal driver expects if necessary three lanes, it is enough here loosely for five, sometimes lauern six vehicles next to each other before a red traffic light. The port is actually in Souda Bay, but there are buses and taxis available to take you right into the city. The bus will leave you at the market place near the old town. There are hotels all over the city but the ones overlooking the harbor are probably where you want to be.